Although it was invented in its modern form in the 1870's, this caliber has in no way been antiquated. Due to its massive firepower, it has been used for civilian, military, and law enforcement purposes for over a century. Whether you need something with incredible stopping power to protect yourself from attackers, something to hunt with, or something to blast clay targets out of the air with, the 12 gauge is your answer to almost every short range problem. Fiocchi is one of the most prestigious ammunition manufacturers in the world. With their phenomenal ammo, you have everything you need for your next shooting competition. 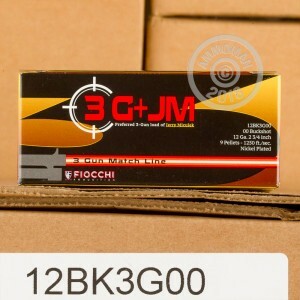 This Fiocchi 3 Gun, 2-3/4", 00 buckshot is designed specifically to meet all your needs for your next three gun competition and is the favorite load of the legendary Jerry Miculek. You have just the power and accuracy you need to win the match with the quality and prestige that Fiocchi brings with this specialty ammo. Good news! 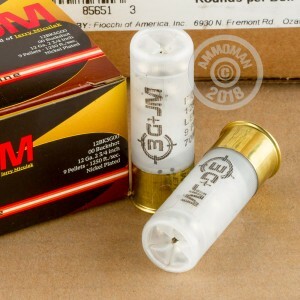 At Ammoman.com all orders over $99 will receive free Shipping! 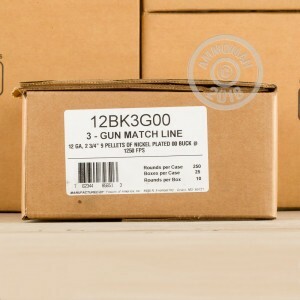 So order this case of high quality 3 Gun ammo today and the shipping is on us! put this stuff in a brand new never fired KSG people were talking smack saying it would jam or not cycle blah blah blah, it burned through this stuff and not one issue for 200 shells... everyone who shot it was happy buying another box. Excellent ammo. When I need more I'll order the same. Devastating home defense load. I'm impressed and the bad guys will be too. Have not had a chance to use any of the ammo, I am sure it is top quality, received it fast and appreciate the speedy shipment!